This entry was posted on December 16, 2009 at 10:58 am and is filed under Science Politics, The Universe and Stuff with tags astronomy, Clover, cuts, Herschel, Particle Physics, STFC. You can follow any responses to this entry through the RSS 2.0 feed. You can leave a response, or trackback from your own site. One other thing is that if you’re a facility which is fully funded by the UK, i.e., no other countries to piss off or contracts to break, then you’re at high risk of being closed. Scientific productivity or potential be damned. It was the same story with Clover. You’d think an entirely UK-based operation would be valued more, but no. We’re closing down all the things we’re good at to become bit-part players in big consortia. All of it is happening to save the pension plan of one inept Chief Executive. Always look on the bright side of life… didn’t you say that those amazing Planck pics/data are due out today? Also, theory at least will do relatively OK in a recession. And Broad got Smith out for a duck. This time we have to demand the Chief Executive’s resignation. Oh, the test match has started! I don’t think I can stay awake much longer, Irish whiskey or not. I hadn’t touched a drop for years until this evening and won’t quite make it to the STFC announcement – I’m too depressed. 146 for 3 as I write this. That’s a “could go either way” kind of score. Anton: I don’t think they’ll save much by cutting theory, unless they pull the plug on the supercomputers. However, my main worry is for the youngsters. Postdocs in theory or observation or experiment doesn’t really matter all cost pretty much the same, and they’re all vulnerable. 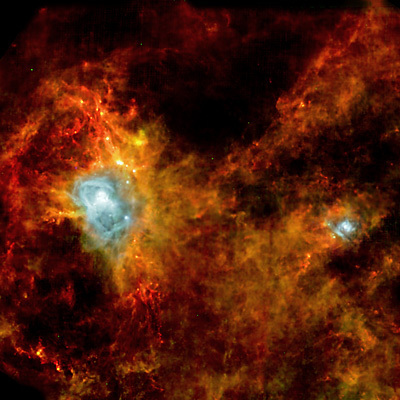 The new Herschel data will be available later today or tomorrow, whenever the embargo is lifted. At least the brightest and the best won’t go to the City to play Faust any more now. Anton: No – they’ll leave the country and never come back. Good luck with the STFC news today. I left the UK several years ago to work at a European university and can only watch with dismay/disgust/etc. the mess being made of basic science in the UK. You mean they won’t go off and work in the theatre? So based on the 5-year costs and savings at the bottom of the STFC page, this is a 25% cut on astro facilities, 27% for space, 17% for PP and 52% for nuclear. Looking at that last one, it could have been worse. Some people were thinking nuclear might be obliterated entirely. The 25% cut in studentships and fellowships is a clear message to young scientists in the UK: if you want to do astronomy, you’re better off elsewhere. A message also that due to the sheer incompetence of STFC management many people are going to have their careers ruined. A sad day in the history of British Science. Didn’t you mean “nuclear might obliterate you entirely”? If not theatre then there’s always room in science fiction, although hopefully not in grant applications for what little dosh is left. It appears Tom was right too. I can see why he is so depressed. UKIRT is indeed to close and, in a couple of years, it’s companion the JCMT will shut too. Yes, thanks! I’ve now added a link to that document up top. See how low BepiColumbo is in the list. It’s still funded though. Funny that. Of course we don’t know how these ratings will translate into cash. I think even the highest-rated projects may still get big cuts in funding. This seems to be following the same steps as the manufacturing industry in the UK. What happened to Moonlite ?? It is down as “below alpha” in the prioritised list. Re not knowing how these translate to cash: the PPAN report recommends 15% cut to alpha-5 and 20% cut to alpha-4 across the board, which at least gives us an idea. The grants situation may be worse than a simple 10% cut (on top of the previous 25% one). The Science Board summary appears to indicate that FIRST all the grants for now-unsupported projects will be removed (presumably now in a phased fashion rather than by immediate cut, thanks to the RCUK emergency handout) and only THEN will a further 10% cut be imposed on those that have survived to that point. Moonlite is the only thing on the list rated “below alpha”, and I think that’s being generous. However, it does involve MSSL so it will probably be fully funded. I missed that bit but am told that MoonLITE got a mention in the press conference. Apparently it will not get funded. Of course it is hard to kill that beasty, it just keeps surviving…. is that they would first identify the number of posts supporting now-withdrawn projects (let’s imagine that is 20% of all posts) according to the first sentence, and then axe 10% of the 80% of remaining posts which were supporting highly-rated projects. It would be easy to imagine that that sort of procedure leads to another 25%+ cut in grants. Let’s hope that the straight 10% interpretation is the right one, but I don’t quite see how the statement above is consistent with that given the `Moreover’. has an interesting last paragraph. I covered the Drayson comment in a previous update. It’s just about the only optimistic thing I’ve seen all day. After a series of previous debacles and accusations that STFC were not listening or consulting with their “stakeholders” , wasn’t the whole point of the FUAP, NUAP and PAAP reviews to ensure that the views of the astronomy and particle physics communities were taken into account? As far as I recall, one of the key recommendations unanimously stressed in all of the reports from NUAP, FUAP and PAAP was that grant lines and in particular, fellowships should be protected. Now, STFC are announcing a 25% cut in fellowships on the basis of these recommendations from their own advisory panels? There is something very wrong with the way this organisation is run. The senior members of the UK astronomy and particle physics communities should be up in arms about this. It is not enough to write blogs and comment from the comfort of their permanent positions…. on behalf of the current generation of struggling postdocs, they should come together and demand an answer from STFC as to why they have once again ignored the recommendations from the community. Looks like I got away just in the nick of time. What of the election – can we expect it to get better or worse under the Tories? I had heard worse; what is the Tory track record on science (v. old Labour’s)? I agree 100% but what Keef and his cronies will say is that he doesn’t work for us, he works for the government and the advisory panels are just that, i.e. advisory and he doesn’t have to take their advice if he doesn’t want to. I think the only way to protect grants to universities (and the careers they support) is to take them away from STFC because it is run by people who won’t listen and who would in any case would sell their granny if they thought it would get Moonlite funded. When I said this two years ago I was shouted down. Grants must go with the facilities, said nearly every astronomer in the country. Now it looks like they’ve succeded in stealing the future. There is indeed “something very wrong with the way this organisation is run”, which is that it is run the way the government wants it to be run rather than the way scientists would like it to be. I think what we astronomers all have to do now is stand together and try to put concerted pressure on Lord Drayson to realise that science is more about people than it is about facilities. Michael: although I wouldn’t go as far as advocating sympathy for STFC, you have to accept that the moves on studentships and grants were hard to avoid in the current situation. When I joined the PPARC Science Committee a whole decade back in a vanished golden age, all newbies were insistent that the highest priority was to put more money into the grants line. What we rapidly learned was the eternal lesson that this is the only place in the spreadsheets where there is any flexibility. Once you accept (a) that the budget is a given and (b) that you’re not leaving CERN, ESA, ESO, plus (c) that things you can leave (Gemini) can’t happen immediately, there’s only one big knob left to twiddle. The problem is the old “I wouldn’t start from here”. You have to go back to the murky dealings that created STFC with a flat-cash budget in 2007. Once that stitch-up had happened, a good deal of today was inevitable. The most significant improvement that could have been made would have been not to let the ESA budget get so out of control by buying into Aurora. Otherwise, grants had to take some hit; and they have done already, but this could probably have been better spread over the past 2 years. I’ve put my opinion on here before, that we clearly overproduce astronomy PhDs and all that does is store up a lot of disgruntlement for most of them who can’t go any further in a scientific career simply because of the arithmetic. Grants are a different story because generally speaking they produce the science results. Compared with the USA we’ve always been ridiculously parsimonious about funding PDRAs and now it’s getting even worse. I agree that a lot of this is an inevitable consequence of 2007 and the only surprise is that they’ve faddled about so long before tackling the problem with any sort of decisiveness. I would content, however, that they’ve actually done precisely the wrong thing. Granted the budget does not allow the programme to be supported at current levels, they had to cut but rather than spreading the pain uniformly, handicapping the entire astronomy programme, they needed to select a subset, fund it properly and scrap the rest. Instead we’ve still got some lower priority facilities limping along while even the alpha-5 rated things still get a 15% cut. I don’t think I do have to accept that cuts to grants and fellowships were inevitable. and then make the hard decisions about lower ranked projects. One thing that (I think) hasn’t been noted here is that although it was announced that studentships and fellowships would be cut by 25% as of next year, John Womersley clarified stating that it did not necessariiy the cuts would be equal. Rather, he suggested studentships might be preferred over fellowships. Given that only 13 PDFs and 6 AFs were awarded last year, we could approximate the total number of fellowships available next year to ~0. I hope that’s a little pessimistic. I agree with much of what has been said here, but I’ll take a somewhat contrarian view in one respect and argue that the 25% cut in PhD studentships isn’t hard enough. It is the fellowships and grants that need to be protected. Far too many people are trained to PhD standard in Britain in basic science who then cannot find jobs within research/academia. It is fellowships and postdoctoral positions that need to be protected. The career situation in astronomy in Britain was already an absolute disgrace. The funding cuts will make things even worse. One reason why the human aspect is treated so poorly in research funding is that the people most affected – postdocs and fellows – do not complain enough. They need to organise and to lobby politicians, and do it loudly. Just because academia is very hierarchical does not mean that more junior people do not have full rights in a democracy. Postdocs of the world unite. You have nothing to lose but your P45s. From the viewpoint of someone who has just started a faculty job overseas: the Advanced Fellowships were already becoming less attractive since (a) they don’t come with any money for students or building a group (unlike similar senior fellowships overseas) and (b) they no longer guarantee a permanent position in the host institution. This additional hit, and the fact that it will now be even harder to get grants for students and postdocs, makes coming back to the UK as a junior faculty member look even less enticing. This is a dreadful year to be a senior postdoc with any interest in coming back to the UK – I have several colleagues in this position, and am very grateful to be safely out of it. Interestingly STFC just sent out a questionnaire to people who got their PhDs in the UK and I ranted about this at some length, but I doubt they will get the message. There will always be people to replace those who defect to other countries. Now the results of the mistakes at the top of STFC are known, it is time for Prof Mason to resign. He can tick the ‘impact’ box and move on. Huw: I don’t think this situation is comparable to that of British industry except in the unhappiness of the situation. After Britain’s postwar boom, other industrial countries came on stream with more modern plant. If you own a machine that takes 12 men to run it and face competition from one that takes two men (this is a real example from part of the shipbuilding industry) then you have a problem. If you don’t upgrade plant then you must cut wages by a factor of 6 to survive. If you did upgrade then you faced Trades Unions who insisted on maintaining wages AND not reducing the workforce. Labour’s 1970s patch was nationalisation, which meant a change in the boardroom but did not address the problem, as was obvious by 1979 with inflation above 20%. Thatcher simply let “nature take its course”. The result was devastating for whole communities, but perhaps the people in those communities should have got more involved with choosing their Trades Union representatives. Interesting – in particle physics we produce more phds than there are jobs, but certainly in my graduation year most did not want to continue in science, but went into other jobs (banking, software deveopment etc) so there were no dissapointed people not able to get science jobs. I would argue for those who did go into other areas the skills they learnt in their PhD were pretty important (though some of them like software expertise could be gained in other ways I suppose). My argument remains that we should move to a different system of postgraduate funding, in line with the Bologna system (3+2+3). I think the number of PhDs should go down but the number of 2-year Masters should go up. The transferable skills bit can be developed there, and the PhD kept for those with a realistic prospect of continuing in a research career. Peter, I happen to agree with you. I think a Bologna-like system is the right way to go. Plenty of people could go through to the end of a 2-years Masters and gain valuable research skills. A smaller number would then go on to a PhD, not all of whom would remain doing research, but the fraction that do could be kept at a level that would seem to be more reasonable. A concern I have is that if it becomes increasingly difficult to remain in a research environment, we will start to discourage potentially good students from taking up a PhD in the first place, and everyone will consequently suffer. I agree; fewer doctorates and better chances for those who opt for an academic career. However, there needs to be some sort of fair selection, as opposed to whoever happens to be in the right place at the right time being able to go on to a degree. Personally, I think the best way is a permanent job right after completion of the doctorate. Let’s face it: it’s already obvious by that time who is good enough and who is not. Saving folks from a string of soft-money positions would let them do more good work in their most productive years. Some folks will object and say that it is good to move around, work elsewhere etc but this is not a contradiction; one could REQUIRE people to spend a running total of between 10 and 20 % at another institute (traditional sabbatical or some other scheme). Certainly if one goes for a few months to another institute one can be more productive there if one has a permanent job to come back to rather than spending most of that time looking for the next job. Old joke: Ex-scientist applies for a job as a taxi driver. The employer asks “special skills” and the candidate replies “master’s degree in physics”. The employer says “sorry, all my drivers have at least a doctorate”. Interesting that the UCU is completely silent on this. Are they not supposed to be our union? Why are they not campaigning about this? We need to see a better balance in Britain (and worldwide) between the number of people working for PhDs in astronomy and the number of long-term research/academic jobs, and Peter is absolutely that the Bologna system with a reduction in PhD studentships would help with this. But it is still right that there should be significantly more people trained to PhD level than there are long-term jobs: many people will choose to take up careers outside academia (often because of better salaries), and some others will not really have the right abilities for careers in research. Equally, it is right that people should need to prove themselves in one or two short-term jobs before obtaining a long-term position. However, the current situation where the ratio of PhD completions to long-term jobs is something in the range of 4 to 20 is absolutely unacceptable. This needs to be close to 2. The STFC funding disaster is likely to mean that the current, unacceptable situation will worsen still further. Equally, we need more fellowships, not fewer, so that the most gifted people have the freedom to prove themselves in research leadership, rather than being constrained in working for a PDRA grant holder. A cut in STFC fellowships will be disastrous. If the STFC is committed to its policy of having a large number of PhD students, even if they are cut by up to 25%, what are those PhD students going to do? Slashing access to facilities will cut access to the data that are needed for PhD projects. Why would gifted people want to stud for PhDs in Britain if we no longer have access to enough internationally competitive projects to provide data for them? My understanding is that the 25% cut is to the funding pot allocated to Education and Training, which covers both Fellowships and Studentships. It appears that it is still to be decided how the pass this on. It could, for example, turn out that studentship numbers will carry on at their present level but Fellowships will be cut by more than 25%. The really big imbalance is between the money going into facilities and the money for doing science. What happens now is that the facilities are on the up and they’re squeezing out the relatively modest funds available for people using them. This is foolish because the new instruments we have produce much more data than previous generations and therefore require more investment to exploit them. We’re going to get the kit, but not be able to do the science. It’s stupid, unless you don’t really care about the science in the first place…. It takes a fair bit to get me out of lurk mode, but I happen to feel strongly about this. Really? Because then how about just telling people? Good and honest feedback is very much lacking in this career. A lot of people random walk through jobs only to get stuck later on. If it’s clear to the higher-powers that some people have little chance of making a career out of Astronomy, it’s nothing less than misleading to give them a job, or agreeing to a letter of recommendation without saying so. Unless of course it’s never that clear cut, and I’m not convinced it is. But I agree with Peter and Ken. I think it’s more honest to have the number of studenships and fellowships more in line with the academic jobs at the end of the ladder. Essentially, if I’m to get out, I want to know sooner rather than later. For as much as love the job (and I genuinely do), I would be kidding myself if I said that I would have still decided to do a postdoc if I didn’t hope to make it all the way. I do, as do the vast majority of postdocs! Arithmetic therefore says that the vast majority of us is simply delusional. I find that uncomfortable. I missed Phillip’s earlier comment, and I definitely agree with you rather than him. You can’t tell who is good enough at the end of a PhD. You need to serve an apprenticeship too. Although it sounds a bit harsh, I think the stimulus of having a short-term contract is necessary to sort people out earlier in their careers. In France and Italy it’s quite normal to go directly into permanent positions immediately from a PhD, with the consequence that there are many unproductive researchers in posts that could have gone to more active people. I agree that some kind of post-PhD apprenticeship has value. I also think there is merit in working in different countries or at different institutions. As much as I do think that we could do a better job of giving people good and honest feedback, people do also have to take some responsibility for their career decisions. Hanging around somewhere waiting or expecting a pemanent job is not necessarily a wise thing (apologies to anyone who feels that this sounds unneccessarily insensitive). To me it seems obvious – and to everyone’s benefit – that we have a system that has some kind of balance so that it isn’t easy to remain in academia, but it also isn’t ridiculously difficult. I’m not against the post-PhD apprenticeship. On the contrary – turns out postdoc life is very different than PhD life (well, a little bit different) and it’s as good for me to try the job out as it is for the job to try me out. And Peter, I also don’t resent the added pressure of a short-term contract. But Ken, for as much as I generally agree that people need to take responsibility for their choices, self-assessment is ridiculously hard and probably depends more on character than real academic ability. Some people seem to think that 50% success rate in job applications is fantastic, others quite the opposite. Perhaps if independent feedback could be obtained upon request one could judge just how one faired against the other applicants. There isn’t an easy way out. Hopefully at the end of the day good science and new ideas are rewarded over anything else, and at the moment I have every reason to believe that this is true. Thus far anyway. But I think that every young astronomer in the UK, who wants to stay in the UK, is now rightly concerned. Not only because of the cuts and the feeling of unworthiness thrown upon us by recent events, but also because the way that career progression dynamics is changing in front of our eyes. It’s probably fair to say we all feel a little bit unfortunate for being the young ones right now. Every little bit of advice, feedback and openness really does count. I do agree that self-assessment is hard, and so I should probably have said something like we need to do a better job of giving good and honest feedback that can then help individuals to make wise decisions about what is best for their careers. The main justification for the imbalance between the number of PhD studentships and long-term jobs in astronomy is the claim that there are lots of excellent career opportunities outside of academia. The reality is that finding a job after completing a PhD can be really hard, and career advice can be difficult to get. Things tend to be far worse for people who have postdoctoral experience: potential employers outside academia regard such people as “over-specialised” or “over-qualified”, meaning a false prejudice that such people cannot develop new skills, or would expect too high a salary to stay in post for the medium term. It can be very difficult for postdocs to find any sensible career advice. So the idea that PhD studentships in astronomy train people of great value to the general economy is based on weak evidence. To return to the comment about the Universities and Colleges Union, the organisation does campaign on the issue of short-term contracts and hourly-paid teaching staff. However, it seems not to appreciate the specific problems of people in postdoctoral positions or the acute problems of short-term science funding. I feel postdocs and postgrads in science would do much better for themselves if they formed a lobbying group. As for the issue of postdocs and postgrads getting advice on whether they make the grade to continue in research, I’m sure that an objective assessment on many would be that they are good enough, but that the career situation is so bleak that many of them will not get long-term jobs in academia, however good they are. The problem is that astronomy research attracts many excellent people, but most cannot continue in the long term because the career situation is so poor. Some do manage to get permanent academic posts, but luck and patronage are very important factors in determining who succeeds. Without luck or patronage, you are stuffed, however good you are. The system should not be like that. All: What’s wrong per se with overproducing PhDs? Isn’t it just a natural wastage pyramid, and happens to everyone in every career everywhere? (One could argue we overproduce undergraduates for PhD places, and pupils for undergraduate places..) And if one started a PhD knowing one were guaranteed an eventual chair, wouldn’t everyone want to do PhDs, so it would just push competition to an earlier phase of one’s career? Are you arguing for special treatment for academics (or purely for better ‘exploitation’?)? Random point: Lots of people are easily ‘good enough’ to do PhDs but choose not to. We would do well to remember that! Bryn: I agree that luck and patronage are alive and well; but how do you fix it? There is nothing wrong in “overproducing” PhDs. Indeed, it is right, and necessary. Training people to PhD standard who then choose voluntarily to leave academic research is absolutely fine. Training people to PhD standard who have to pursue careers outside academia because they do not have the very highest research abilities is absolutely fine. What is wrong is that we attract too many really good people to work for PhDs in astronomy who are excellent at research, and who are committed to continuing in their careers, who are forced to give up after one, two or more postdoc jobs. These are people who then have real difficulty in finding meaningful careers after failing in their aspirations. There is no problem in having a pyramid. The problem is that the pyramid is much too broad at the bottom relative to the top: it is too extreme. Having fewer PhD studentships would lessen the number of people forced out after a decade or more in academic research. We attract people to PhDs in astronomy who would, given other circumstances, be equally prepared to pursue PhDs in applied science that is of direct benefit to the economy. Astronomy and particle physics actually damage the economy by luring bright people away from applied science. To reduce the influence of luck and patronage, we need to free people to compete. There need to be more fellowships so that more people can demonstrate what they can do on their own initiative. We need to foster a culture where postdocs are not overly directed by grant holders and have more freedom to initiate projects and pursue their own ideas. The STFC needs to allow all postdocs to apply for grant income up to some limit, so that they can apply for computing or other equipment to prove that they can get funding on their own initiative. Candidates should be able to apply for fellowships without being nominated by university departments (yes, it would increase the number of applicants, but it is necessary to break the need for patronage). The STFC needs to ensure that all research-active staff, permanent or on short-term contracts, have sufficient travel funds to get one international conference a year through a dedicated small, flexible grants scheme; postdocs themselves should be able to control any travel funds (or has that change been made by now?). The concordat on research careers should be implemented (rather than being ignored completely except in those cases where a favoured individual is concerned); any academic in a position of influence over fixed-contract staff should be required to attend a university course explaining the obligations of the concordat. Group leaders should offer senior postdocs to nominate them for some committee work (on time allocation committees and the like, if there are any TACs after the STFC’s axes). The hierarchy needs to be lessened and people need to be set free. What could campaigning possibly bring? Threats only work if there is a real potential of following them up, i.e. going on strike. I doubt most PDRAs etc would go on strike, simply because it damages their own work, and even if they did, it would exert no pressure on those who decide. Sure, if the employer can make a choice, he will. However, if the choice is a mediocre person doing something, or no-one at all, he will go with the mediocre person, because at least SOMETHING gets done. Also, he doesn’t want to set a precedent that he doesn’t need employees. I agree about France and Italy: many non-productive folks get permanent positions. However, I think the reasons lie elsewhere. I can think of dozens of examples of high-flying PhD students who just never turned into truly independent researchers. It’s very hard to predict who will make that transition and who won’t. I certainly don’t doubt your experience, though it doesn’t agree with mine. Question: did those who “didn’t make it” do so because they ran out of scientific creativity, or did they do so for external reasons? The discussion about research careers has died down, so perhaps I can turn to the cuts in facilities. I argued at the time that the U.K. was expelled, temporarily, from the Gemini project two years ago that a minimal research capacity in ground-based astronomy for the United Kingdom would require access to one 8-metre class optical/near IR telescope in each hemisphere. It appears that this is now going to be lost, and even access to one 4-metre telescope in each hemisphere may go as well. In the past many people have argued that the UK doesn’t need access to both hemispheres, one will be enough. I think that’s true for some areas but it clearly isn’t true for all of them and I’m wondering what the justification is from the science panel/STFC for limiting the UK to the southern hemisphere. Turning this back to the human fall-out, the potential closure of some of the observatories in the STFC’s hit list will mean job losses for those in mid-career with little prospect of 1) returning to the UK and working in academia (we don’t have teaching experience or research groups) and 2) finding positions at other observatories as there appear to be very few suitable positions available these days. In the good old days people were hired at SERC/PPARC overseas facilities with the expectation they would return to a UK university and use their experience in teaching and research. This changed a few years ago, rightly or wrongly, to keeping people at those facilities so that their experience and expertise would be used to get the best out of them which of course benefited the whole UK astronomy community. Now those people (yes, I’m among them) are in a dire position and often have family and/or mortgages to worry about plus all sorts of immigration, medical and social security issues to worry about as well. I would argue that yes, we’re screwing up many PhD students and postdocs plus our whole science future, but we’re also screwing up the lives of those in mid-career who have devoted themselves to UK astronomy and we’re about to lose all the experience those people have built up over the years. If they do find other jobs in astronomy it’s likely to be for other countries who I’m sure will be grateful to the UK for funding their new employees’ education and training. Of course, the reason for the STFC strategy for the UK to have access to ground-based optical/NIR facilities in only one hemisphere is that the UK is now (rightly) a member of ESO and the financial crisis prevents any significant other capacity. We could find some scientific justification for concentrating in the south (e.g. VISTA; linking in with ALMA), but equally there are very strong scientific reasons for maintaining access to both hemispheres. The real reason for the one-hemisphere policy is not scientific, it is the financial catastrophe and the space/ground balance. The discussion here has so far emphasised the problems for early-career researchers. But Tom Kerr is absolutely right to raise the issue of middle-career researchers. The STFC funding cuts will mean redundancy for many dedicated staff members of the facilities axed. What is worse is that there will be virtually no alternative career opportunities in astronomy in Britain, and absolutely no obvious other career opportunities. But the same problem affects those of us who have been employed on fixed term contracts in Britain. The career situation has been a disaster for years, and the current cuts will add even more people to the bonfire. Surely there is a strong responsibility for the STFC to provide support to the people affected by the closure of facilities, to relocate back to Britain and to provide careers advice. One small note of solace: I don’t believe teaching experience or teaching ability has much importance in recruiting to lectureships (if teaching mattered, I’d probably be a pro-vice-chancellor!). Yes, of course, experienced scientists trained at great expense in Britain will have to look for employment in other countries. It’s not that the grass is greener on the other side; it is that the grass in Britain has been deliberately torched in the scorched-earth policies of research councils and government. The current cuts are just the latest in a long history of science policy ignoring the human element. Following on from the discussion about studentships/fellowships… I see a note on the job rumors page, dated today, that the STFC postdoctoral fellowships round has been cancelled, and candidates informed by email – anyone able to confirm that? Sorry I didn’t know for sure until just now. It’s not surprising in the circumstances. Still crap though. The news about the scrapping of the STFC Postdoctoral Fellowship Scheme has now appeared on the STFC website. The website reports that the 25% cuts in PhD studentships and fellowships will be implemented by scrapping Postdoctoral Fellowships altogether in 2010 (i.e. the 2009 applications) with 15% cuts in studentships and Advanced Fellowships. It will review the policy in future years. This is disastrous for the few tens of candidates who spent weeks on preparing their applications. And a total waste of time for the people who will have refereed them. Hundreds of Postdoctoral Fellowship applications? If 15 to 20 U.K. research groups nominated candidates and there were 2 to 3 Postdoctoral Fellowship candidates from each, that would be 30 to 60 applicants. The rule that applicants must be supported by university departments, and each department has a quota of applicants, must keep numbers fairly low, surely? Some of the quotas are a bit larger than 2-3 (it depends on the department), and there are probably more like 35 departments nominating. I would guess there are about 100 PDF applications in the system, plus even more AFs. There were 173 applications for PDFs in 2008/09 (13 awarded, so success rate of 7%) and 199 for AFs which were cut from 12 to 6 (success rate 3%*). I suspect a similar number were submitted in 2009/10 – due to the quota system – for which the PDF round is cancelled, allowing a near normal AF allocation (circa 11) despite the overall 25% budget cut to studentships/fellowships. *The education panel had not intended to cut AFs instead of PDFs last year but circumstances (actually snow) beyond their control led to this outcome. Last year PDF applicants were lucky. Not so this round. So Peter was broadly right about the number of applicants for STFC fellowships. Paul Crowther’s figures are very interesting, and greatly worrying. They show that even before the new cutbacks, the situation relating to STFC fellowships was impossibly difficult. A success rate of 3% for Advanced Fellowships is an astonishingly low figure, and is something that parliamentarians should be aware of. Even in a normal year, the success rate would therefore be about 6%, with a similar number of Royal Society University Research Fellowships in the system. It illustrates just how extremely poor the career situation has been: I can recall a PPARC Chief Executive arguing that the only route to a career in astronomy in Britain was via an AF or a URF. The applicants for the AFs (and URFs) were all considered worthy to hold such positions by the sponsoring departments – and by implication worthy of academic careers. Some unsuccessful applicants will apply in future years, but then other, now-junior, researchers will grow in experience and will join the competition. And now the postdoctoral fellowships have been eliminated. Terrible.